It’s not just neat-freaks who need to know how to clean a shower head: everyone should make a point to do this at least once a season for the sake of their health and their plumbing. Although a nice, long shower is a great place to relax or even come up with some of your most creative ideas, if you haven’t cleaned your shower head lately, you are not getting nearly as clean as you think. One-third of shower heads tested by researchers were found to contain a bacteria associated with pulmonary disease. 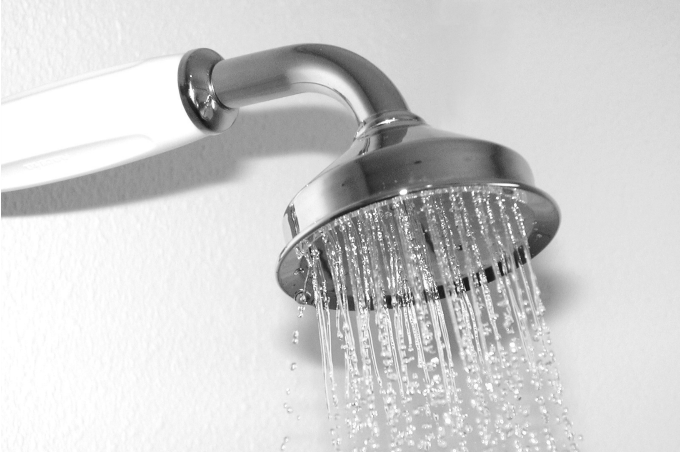 Dirty shower heads are also related to the spread of Legionnaires disease. Fortunately, cleaning your shower head isn’t tricky. The payoff — besides a healthier bathing environment — is a better, stronger spray of water! Here’s how to clean yours. If it’s been a while since you last cleaned your shower head, or if you’ve never cleaned it at all, start with a deep cleaning. 1. Combine 3 cups of very hot water and 1 cup of white vinegar in a large bowl. 2. Remove your showerhead (usually by unscrewing) and shake out any excess water. 3. Put the shower head in the vinegar water and let it sit for 30 minutes. 4. Use an old toothbrush or bottle brush to scrub the shower head inside and out. Swirl to dislodge additional gunk and allow the shower head to sit an extra 5-10 minutes. 5. Give it one more scrub, drain the water, and rinse the shower head thoroughly. 6. Let the shower head fully air dry. Now is an excellent time to use the brush on the shower pipe’s threads to remove any buildup there, too. You may want to wrap Teflon plumber’s tape around the tube a few times to ensure a tight seal. Reattach the showerhead when it is completely dry. Once you’ve deep-cleaned your showerhead, you don’t need to remove it again unless you see significant buildup. Just spray it monthly with a vinegar-based cleaning solution (like this daily shower spray works) and scrub the spray nozzles to dislodge residue and bio-film. Run the shower to rinse the spray head, and you’re done. If your showerhead does acquire stubborn buildup between deep cleanings, you can soak it in place to loosen the gunk before scrubbing. 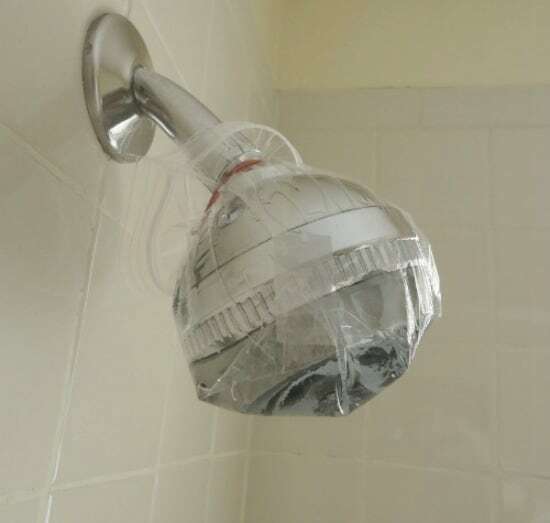 Just combine equal parts white vinegar and hot water in a plastic bag then attach it to your showerhead with a rubber band. Let that sit in place an hour, or even overnight, and scrub it with a brush to get it clean again. Note: This post originally appeared in July 2013. It has been updated for republication. 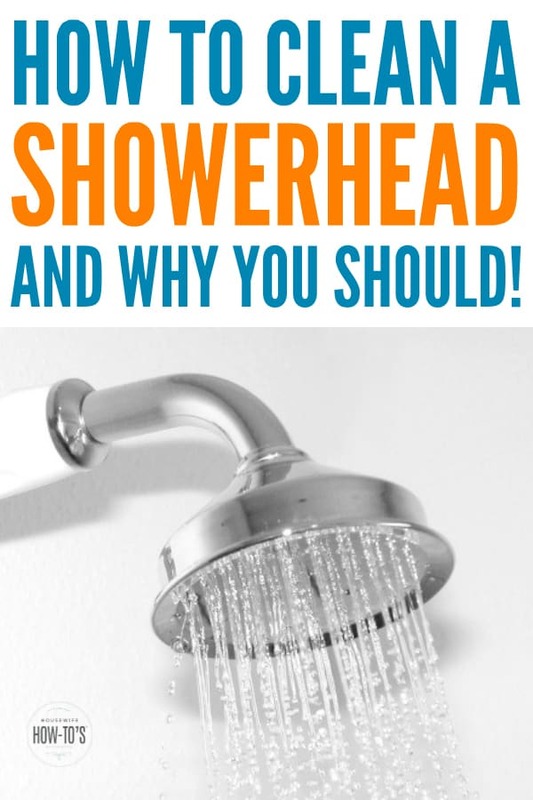 Great into regarding the nasty (and unhealthy) shower heads around our house. Cleaning them all with vinegar as you’ve suggested. THANKS! I put the shower head into a small container of bleach mixed with water and soaped it overnight. The next morning I found the container of water turned into black colour with sediments. Can someone explain to me what that is please? It’s hard to say. It could be mold or it could be a gasket that’s wearing out. need to use vinegar, may have been a reaction with plastic metal shower head and bleach. Always use vinegar to clean shower heads, coffee pots, etc. What brought me here was how to learn how to clean a hand-held shower head and hose. Looks like I’m going to have to buy a new hose and place the showerhead inside a bowl full of vinegar. That should be inexpensive. It just hit me that a hand-held and hose must breed a lot of mold. Maybe you can address this in a future post. That’s something I’ll add to my list. Thanks! Why not just unscrew the showerhead and place in a bag of vinegar? It isn’t very easy to keep the vinegar from spilling out while trying to get the rubberband around the baggie. You’ll notice that’s the first set of directions that I gave. Thanks for the help. I removed both the shower head and the flexible hose leading up to it. Does the hose also need cleaning? Can the hose be cleaned the same way? Hi I just discovered my shower head was so filled with mold yuk! I was ready to jump in shower and I had look up and there it was awful creature MOLD. I was wondering why my skin felt so itchy and my face felt like fire. Isn’t it nasty stuff to find? Glad you got yours cleaned! I’m not a doctor, so I don’t feel comfortable saying whether your showerhead is to blame or not. But, if you have any reason to wonder, it doesn’t cost much to replace a showerhead — you can find them for as little as $15 and it’s a 5-minute task to replace it. I’d also recommend seeing a dermatologist to find out if a steroid cream could quickly treat it. Micobacterium Avium Complex lives in shower heads. This is a serious illness if inhaled by the lungs. But it’s rare to acquire. I was one of the unlucky ones. I don’t know where I even picked it up, but I used to work with the public. Clean your shower heads. What a horrible experience you went through! I hope you’ve fully recovered, and thank you for warning others about these risks. I have just sent off sputum to be tested. My CT scan suggests I might have it. The antibiotic treatment sounds horrible. Did you have them. How did you cope. Kathy, I have bronchiectasis and now Non-TB MAC. Until now no one ever told me my shower head and hot showers could be the cause. Wow! They can also cause “hot tub folliculitis” which resembles skin manifestations of TB, psoriasis, eczema, and boils. Who knew, right? Great tips! The Shower head came up a treat! Stupidly been using standard “bathroom cleaner” previously and could never get mould off. Goes to show – the old ways are the best ways – hooray for vinegar! Just a pity it makes my bathroom stink while you are soaking. Are there any spray products to clean mold in the shower that I can get at the grocery store?? I believe Clorox makes a line of them. Could you buy an empty spray bottle and put vinegar in it? Sure! I stash spray bottles filled with my homemade cleaning mixes under the sinks in every bathroom and the kitchen. My poor shower head is crying out of a cleaning -the shame!! Don’t feel bad, Kelly. I didn’t know how important it was to clean the thing until my husband started chemotherapy. The doctor’s office gave me a long list of trouble-zones for immune-compromised people, and this was one of them. Before that? I never gave the shower head a single thought!